Erbil, Kurdistan Region, Iraq (cabinet.gov.krd) – Kurdistan Region Prime Minister, Nechirvan Barzani, yesterday received the Head of United States Senate Armed Services Committee, Senator Tim Kaine, and his accompanying delegation, including members of the Senate Armed Services Committee and the Senate Foreign Relations Committee. Senator Kaine said that the aim of his visit is to closely observe the situation in the Kurdistan Region. He thanked the people, government and Peshmerga forces of Kurdistan Region who do not only confront the Islamic State Terrorist organisation, ISIS, but also accommodated and continue providing assistance to over 1.7 million refugees and internally displaced people, IDPs. The US Senate delegation members expressed its concern over the ISIS recent advances, and the lack of a plan to eradicate the terrorist organisation, stressing that in their meetings with the Iraqi Prime Minister, Haider al-Abadi, they will urge him to further involve members of the Sunni community in the fight against terrorism. The delegation expressed its support for the Kurdistan Region’s concerns regarding Baghdad’s attitudes, reiterating that the Iraqi federal government should pay the Region’s liabilities, based on the laws and agreements reached between the two sides. Prime Minister Barzani thanked the US Senate delegation for its visit and the assistance of the people and government of United States to Kurdistan Region, particularly military and humanitarian assistance, which have played a significant role in repulsing ISIS. He hoped that the assistance to the Region will continue. Prime Minister Barzani urged the delegation to play a role in settling the differences between Erbil and Baghdad that would lead Baghdad to abide by the December agreement on oil export and budgetary issues, and fulfils its commitments. He also urged the delegation to encourage the international community to fund the United Nations agencies operating in the Kurdistan Region in order to be able to continue delivering their assistance, as the Region continues receiving new waves of IDPs. Exchanging views regarding the relations between United States and Kurdistan Region, and the challenges that the Region faces, were also discussed in the meeting. Erbil, Kurdistan Region, Iraq (cabinet.gov.krd) – Kurdistan Region Prime Minister, Nechirvan Barzani, yesterday received the United States Ambassador to Iraq, Stuart Jones, and his accompanying delegation. Ambassador Jones expressed his government’s support to the Kurdistan Regional Government, KRG, and Peshmerga forces in the war against Islamic State terrorist organisation, ISIS, stressing the continuation of this assistance in all the fields particularly military assistance and training of the Peshmerga forces. He also discussed the situation in the region in general and confronting ISIS in the areas that are under its control, in particular. Regarding the differences between the KRG and the Iraqi Federal Government, Ambassador Jones hailed the KRG for its commitment to the agreement reached last December between KRG and the Federal Government. He stressed that it is necessary that Baghdad abides by the agreement and send Kurdistan Region liabilities fully as there is a heavy financial burden on KRG. He reiterated his support for settling the differences between KRG and the Federal Government through dialog and negotiations. Prime Minister Barzani hailed the support and assistance of the people and the government of United States to the people, government and Peshmerga forces of Kurdistan Region, especially in this difficult time. He briefed the US Ambassador about the situation in the region, the war against terrorism, and the victories marked by Peshmerga forces against ISIS. Prime Minister Barzani stressed that the Kurdistan Region desires to settle the issues with Baghdad through negotiations. However, he said, if Baghdad does not abide by the agreement, the KRG will take any measure that can ensure the life necessities of the people of the Kurdistan Region, particularly the civil servant salaries and the requirements of the Peshmerga forces. Erbil, Kurdistan Region, Iraq (cabinet.gov.krd) – Kurdistan Regional Government Prime Minister, Nechirvan Barzani, yesterday received the Defence Senior Advisor Middle East in the UK Ministry of Defence, Lieutenant General Tom Beckett, and his accompanying delegation. General Beckett discussed the latest security developments in the region in general and in the Kurdistan Region in particular. He also discussed continuing and increasing trainings for Peshmerga forces by the UK military. He commended the Peshmerga forces who courageously confront the Islamic State terrorist organization, ISIS. He lauded the protection they provide to all people in the Kurdistan Region regardless of their ethnic and religious backgrounds. He informed the Prime Minister that the Peshmerga forces are successful in the training programmes and they satisfactorily fulfilled their tasks. General Beckett also discussed the situation in the areas under the control of ISIS. He stressed the need for cooperation and coordination among all forces, including Iraqi and Kurdistan forces, in order to defeat the terrorists. Prime Minister Barzani thanked the UK government for supporting and assisting the Kurdistan Region since the terrorist threat emerged. He expressed his wish that training programmes for the Peshmerga forces continue and increase. He hoped that the ongoing satisfactory coordination and cooperation between coalition forces and the Kurdistan Region would continue and expand, which are vital to eliminate terrorist threats. Erbil, Kurdistan Region, Iraq (cabinet.gov.krd) – The Kurdistan Region Council for Oil and Gas Affairs yesterday met with the five political parties of the Kurdistan Regional Government, KRG. Recent developments regarding oil and budget issues between the KRG and the Iraq Federal Government were discussed. It was reaffirmed that the KRG has been abiding by the December agreement with Baghdad and the Iraq Federal Budget Law 2015, while the Iraqi federal government has not been fulfilling its obligations. 1. KRG aims to settle its differences with Baghdad through dialog and negotiations based on the Iraqi Federal Budget Law No. 2 of 2015, as it is in the interest of both the Kurdistan Region and Iraq. 2. If the Federal Government does not abide by the Federal Budget Law, the KRG will be obliged to pursue other legal solutions to solve Kurdistan Region’s financial difficulties and provide the Region’s people with security and other basic necessities in light of Law No 5 of 2013 of the Kurdistan Parliament. 3. The political parties in the Kurdistan Region support any measure that the KRG will take to ease its financial and economic difficulties and ensure people’s security and income, particularly at this time when fighting terrorism and accommodating a very large number of displaced people have heightened the burden on the Kurdistan Region. 4. In taking whatever measures, necessary to ease the Region’s financial crisis, the KRG remains open to resolving its differences with the Iraqi Federal Government through dialog and negotiations. The KRG does not desire to break its relations with Baghdad, as Iraq is of significant political, geographical, and economic importance to the Kurdistan Region. Vienna, Austria (dfr.gov.krd) – The KRG Department of Foreign Relations hosted a two-day conference in Vienna for the Kurdistan Region missions abroad. The conference was co-chaired by Deputy Prime Minister Qubad Talabani and Head of Foreign Relations Falah Mustafa. Minister Mustafa welcomed Deputy Prime Minister Talabani and KRG Representatives to the conference aimed at exchanging ideas and discussing future plans on how to best serve and promote the interest of the Kurdistan Region. Deputy Prime Minister Talabani touched upon the crucial role played by the DFR as well as the KRG Representations abroad in building cultural, political, economical and educational bridges with the international community and promoting the interest of the Kurdistan Region abroad. Mr. Talabani also briefed the KRG Representatives on the steps taken by the KRG in dealing with the military, humanitarian as well as financial challenges facing the Kurdistan Region. During the conference, the representatives presented their activities over the past few years and discussed their future plans. The representatives also emphasized that it was important to overcome the challenges facing the KRG Representations abroad in order to further strengthen ties between the Kurdistan Region and the international community. They reiterated their commitment to serve the interests of the Kurdistan Region in the international arena to the best of their ability. Deputy Prime Minister Talabani and Minister Mustafa expressed their full support for the KRG missions abroad and stated that the KRG and the DFR, in particular, will make necessary efforts to overcome the challenges facing the KRG missions and to bring about better coordination between the representations and the relevant KRG ministries. The KRG Representatives who attended the conference included Dilshad Barzani, Representative to Germany; Karwan Jamal Tahir, Representative to UK, Bayan Sami Rahman, Representative to USA; Nazim Omer, Representative to Iran; Dara Bakir Salih, Representative to France; Haval Syan, representative to Australia; Rezan Hama Salih, Representative to Italy; Daban Shadala, Representative to Spain; Mustafa Ismail Ramazan Goran, Representative to Austria; Fauzi Kaddur, Representative to Switzerland; Aso Jangi Burhan, Representative to Russia; Ziyad Raoof, Representative to Poland; Delavar Ajgeiy, Representative to EU; and Shorsh Kadir Rahem, Representative to Sweden. 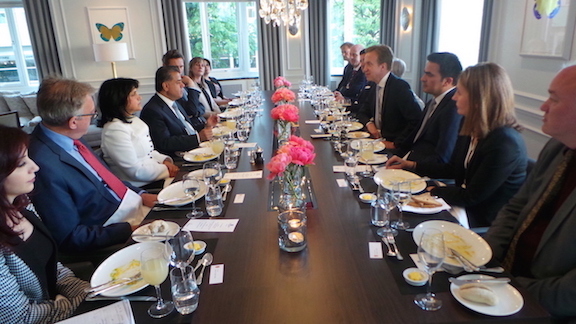 Oslo, Norway (dfr.gov.krd) – In today’s meeting between Minister Falah Mustafa Head of KRG Foreign Relations and Børge Brende Minister of Foreign Affairs of Norway, Minister Brende announced that Norway will soon open its representation office in the Kurdistan Region. During the meeting, which was attended by Iraq’s Ambassador to Norway Sundus Omer, Norwegian Ambassador to Jordan and Iraq Sissel Breie as well as several other officials, both Ministers discussed bilateral ties, the ongoing fight against ISIS and the humanitarian conditions of refugees and IDPs in Kurdistan Region. Minister Mustafa thanked the government of Norway for its decision to open a representation office in Erbil and stressed that the opening of the office will lead to further cultural, political and economic ties between Norway and Kurdistan. Minister Mustafa expressed the gratitude of the government and people of the Kurdistan Region for Norway’s continued support and stressed that the KRG will continue fighting the ISIS terrorists and providing assistance to refugees and IDPs. Minister Brende asked Minister Mustafa to convey his greetings to the president and prime minister of the Kurdistan Region. Erbil, Kurdistan Region, Iraq (cabinet.gov.krd) – Prime Minister, Nechirvan Barzani, yesterday received the Kuwait Consul-General to the Kurdistan Region, Dr. Omar Ahmad Al-Kandari. Prime Minister Barzani welcomed the Kuwait Consul-General to his new position. They discussed the latest developments in the Kurdistan Region, particularly the war against terrorism and the economic and social impact of hosting nearly two million refugees and internally displaced persons, IDPs. Investment opportunities were also discussed and the Consul-General affirmed the desire of his country’s companies, investors, and relevant institutions to develop economic and commercial ties with the Region. He described the opening of the Kuwait Consulate General as an important step in that regard. Prime Minister Barzani expressed his happiness at the establishment of relations between the Kurdistan Region and Kuwait, offering the support of relevant KRG organisations to Kuwaiti companies that wish to invest in the Region, particularly in priority fields such as agriculture and tourism. With Kuwaiti media representatives present in the meeting, Prime Minister Barzani explained the political, economic, security, and military situation in the Region. Regarding relations with Baghdad, he said that at this moment the KRG intends to resolve its differences with Baghdad. He said that Iraq is important for Kurdistan Region from geographical, political, social, commercial, and economic points of view. He said, however, that if the current breach of agreements by Baghdad continues, then the Region would have to turn towards other options. Erbil, Kurdistan Region, Iraq (cabinet.gov.krd) – Kurdistan Region Prime Minister, Nechirvan Barzani, yesterday received the United Nations Under-Secretary General for Humanitarian Affairs, Mr. Stephen O’Brien, and his accompanying delegation. Mr. O’Brien briefed the Prime Minister on his visit to Baghdad where he visited camps of internally displaced persons, IDPs. He said he will also visit IDP and refugee camps in the Kurdistan Region. Mr. O’Brien thanked the Kurdistan Regional Government, KRG, for the assistance it has been offering to displaced people. He described the relations between the United Nations agencies and KRG as positive and effective. He said that the United Nations’ 2015 plan for assisting displaced people is soliciting over $1.5 billion from donor countries. He said, however, few countries so far offered assistance, except Kuwait that announced it will donate $200 million. Mr. O’Brien noted that within the framework of the 2016 plan the Kurdistan Region will be dealt with separately as it disproportionately needs more assistance than other areas of Iraq. Prime Minister Barzani said that due to the arrival of a high number of displaced people, particularly since the Islamic State terrorist organisation captured Mosul last June, the population of the Region has increased by 28 percent and continues to increase. Though all IDPs are Iraqi citizens, he noted the Iraqi government does not help to accommodate them and provide assistance to meet their needs in areas under KRG control. This has put an enormous burden on the Kurdistan Region. Prime Minister Barzani called on the international community to assume its responsibilities as the Kurdistan Region accommodates and provides assistance to a very high number of refugees and IDPs, while at the same time it conducts a war against terrorism on behalf of the entire world. He warned that due to ongoing war in Syria and Iraq, the Kurdistan Region could face additional waves of refugees and IDPs.